Formula One would "not be what it is today without the key players"
(CNN) -- Reigning Formula One champion Lewis Hamilton has told CNN in an exclusive interview that the loss of big teams from the 2010 Championship would damage the prestige of the sport. The 24-year-old McLaren-Mercedes driver said the sport faced an uncertain future in the wake of Ferrari, Renault, Red Bull, Toro Rosso and Toyota have threatening not to race next season because of proposed rule changes. "Formula One would not be what it is today without the key players - without McLaren, Ferrari, Renault - without these key manufacturers there. So it will be interesting to see what happens over the next couple of months." The teams have until May 29 to confirm their entry in next season's competition but the Briton said he would be focused on his own battles: "It's not for me to worry about as we have enough on our plate to be dealing with." Hamilton will be hoping for a repeat of last year's winning form at the famous race around the streets of Monte Carlo after five rounds of the current season has yet to produce a podium finish. The nine points Hamilton has secured this season leaves the defending champion in seventh place behind leader and compatriot Jenson Button after five rounds, a situation that has resulted in a lowering of ambition for the driver. 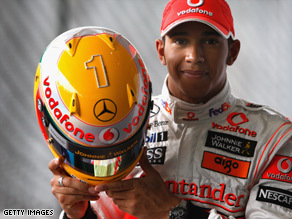 "I think realistically (we're) hoping to get back in the top three of the Drivers' Championship," Hamilton admitted. "With the improvements we have coming, hopefully, if they pay off, this will be a realistic goal, but to catch the guys at the front it will be tough." Despite dominating the sport in recent times both Ferrari and McLaren-Mercedes have struggled to compete this season with Championship front-runners Brawn GP. The the team led by Ross Brawn have surprised many with their performance in their debut season, Hamilton would not count himself among them. "I'm not surprised simply because of the people that are involved in Brawn GP, they have great drivers there too," Hamilton said. The Monaco GP takes place on Sunday May 24.